Barnacle Goose Paperworks: Caterpillar, Centipede or Millipede? 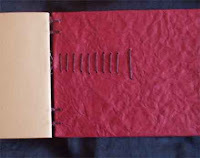 I had seen and admired Keith Smith's caterpillar spine sewing in his Non-Adhesive Binding Volume II [keith a smith BOOKS 1994], and in fact the book (with all his others) was on my shelf, but I had felt daunted by the complexity of the sewing. Keith credits Betsy Palmer Eldridge with teaching him the caterpillar. A couple of years ago Adele Outteridge (Studio West End, Brisbane, Australia) taught several coptic binding styles in Auckland, NZ, including the caterpillar, but I just missed getting to the class. I live in Sydney, Australia, but I try to get to New Zealand each year to make books with my friends in Auckland (on the North Island), and that year my timing was wrong. However, generous Elizabeth Steiner allowed me to photograph the books she made in Adele's class and I decided to try making the caterpillar from the photograph. I prepared a few book blocks and covers while staying with binder & good friend Sheila Coltman, and then went on to the South Island to stay with my friends Alison Evans & Dain Simpson at their resort, The Portage, in the Marlborough Sounds. I knew I would have plenty of time for sitting in the sun and sewing a book or two. After doing a 4 needle coptic stitch I had the book secure but I had no idea how to start the caterpillar. I had already punched the holes using Elizabeth's photos as a guide and after a couple of false starts I got into the swing of it. I was delighted to find my caterpillar forming, though I suspected, quite rightly, that it left a bit to be desired as far as Keith's caterpillars go. I also decided that mine was a centipede because a caterpillar only has 6 legs. I did all my sewing in the sunny lounge at The Portage Resort Hotel, looking out over the glorious blue Marlborough Sounds, and occasionally being offered hot chocolate or a glass of NZ wine (Marlborough Sauvignon Blanc of course) by the bar staff. The other guests were fascinated and I had to overcome my desire to go and hide and instead gave quick off-the-cuff explanations of hand book binding. I found this very satisfying actually as most people are amazed that it is possible to make a book and they loved to see the books taking shape. 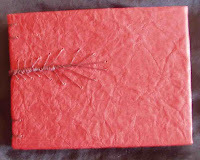 When I returned home I started another smaller book, also a coptic, sewn with 6 needles. The caterpillar, now a centipede in my mind, was made following the instructions in Keith Smith's book [pp 265-271]. In these instructions each caterpillar actually attaches the book block - in other words sewing the sections, but mine were already sewn so I sewed into the 2nd and 3rd stations. At first sight the instructions are incredibly complicated, as are just about all of Smith's diagrams but if you really concentrate they are quite wonderful in their intricacy and detail. You just need to be fairly dedicated and desirous of the end result. Another version of this stitch has been developed by Abi Sutherland at The Evil Rooster Bookweb. Keith's stitch takes 7 stages to make each section of stitches but Abi has designed her Half-Hitch Millipede Stitch which takes 4 stages. This is an elegant solution and Abi's instructions are wonderful. In fact her entire site is wonderful so please have a good look. Are you doing ok? You mentioned a visit to the oncologist. I hope all is well with you, my dear friend. Judy, Thank you. Warm hugs to you on a warm and pleasant day here. I think it's about 80F. It would be lovely to show you the resort - maybe one day. Sky, thank you for your comment, I'm pleased you liked my post. I think all book binders see binding as an art form and certainly there are some stunning and inspiring books out there that I can only look at with great appreciation. Just bought the DVD set of LOTR so looking forward to having a binge viewing. You are very clever making one of these. I agree about Keith A. His diagrans look so complicated. I find them easy to follow once I have already made the book! I just have volume 1. I really like this centipede and will do more but I think I'll have to follow my own design. I have almost all of Keith's books and I just love reading them and making plans. I'm better at the plans than the actual carrying them out but there's a lifetime of ideas there in his books. I'd like to go to his classes but I've never been in the right place at the right time. I am so pleased to have found your beautiful blog through Astrid at Tulibri. I am going to check out all your booklinks and try to make a slot book. That should keep me busy! Diane, good luck with the slot book. Let me know if you have any questions. Amanda, I'm so pleased you enjoyed Evil Rooster - that's a great web site. I just bought Keith Smith's book so I could learn the caterpillar stitch. I am also intimidated by it's complexity. Your blog has given me hope that it can be done. 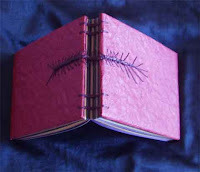 Your pink book is to die for, I can only imagine how much work it takes to make one of these. Thanks so much for sharing!